Lot Detail - 1924 Babe Ruth New York Yankees Autographed Game Used Professional Model H&B Louisville Slugger Home Run Bat (PSA 10 / MEARS A10 / JSA) "Awarded To Phil Grossman, Champion Batter"
1924 Babe Ruth New York Yankees Autographed Game Used Professional Model H&B Louisville Slugger Home Run Bat (PSA 10 / MEARS A10 / JSA) "Awarded To Phil Grossman, Champion Batter"
Historically, symbols have been selected to represent the attainment of success. Many of the symbols are unique to a specific group. For example, the Salmon is a symbol of prosperity to Native American Tribes. The three-legged monkey frog, or “Chan Chu”, is a Chinese symbol of prosperity and is intended to drive away evil. The horn of plenty or cornucopia has its roots in Roman mythology and is associated with a bountiful harvest. In my opinion, nothing symbolizes American greatness and success more than the Great Bambino, George Herman “Babe” Ruth. Babe Ruth and his historic bat transcend sports memorabilia and elevates to the level of fine art. In today’s competitive business environment, a uniquely strong symbol such as a world class Babe Ruth bat can serve as a cutting edge form of corporate branding. Corporate branding is intended to deliver a clear message about your brand, create credibility in the marketplace, form an emotional bond connecting your target prospect with your product or service, motivate the buyer to make a purchase, and create brand loyalty. Thinking it to never be possible, now Babe Ruth can be added to your lineup and creating a marketing brand which boldly states, “We are a winner, you can be too!” Imagine this bat as the focal point of your corporate lobby and the prestige associated with owning this iconic relic. Additionally, Ruth serves as a bond of the generations starting with a link to the roaring 20’s and the rise of American industrial innovations, fashion, and culture, with the effects and improvements being felt to this very day. Examples of the growth of America could be seen in the popularity of jazz, growth of the use of automobiles, telephones, radio, and electric appliances. Charles Lindbergh was a National Hero as aviation allowed America to expand our horizons. Entertainment boomed as the country was filled with palatial movie cinemas and gigantic sports stadiums. Atop of the new entertainment field stood one lone figure, Babe Ruth. Babe Ruth dominated the 1920s and ended his career as the greatest sports figure of all time. His life’s achievements documented the drive to succeed and the attainment of unattainable goals and successes. Today’s entrepreneurs are forever linked to the seeds of success sowed during the 1920s. Today’s tech, science, and financial giants were directly influenced by the success of Babe Ruth during the era. To capture that spirit, to show it, to preserve it, we have to remember, Babe did it with this bat, a symbol to inspire. In order for a bat to be authentic, it must be consistent with known manufacturing traits, (length, weight, model), and bear game use associated with the player. In order for a bat to be valuable and highly desirable, it must have provenance, or traceable origin. Throw in an authentic autograph, and you have the combination for the hobby’s most valuable bat available for public sale. Provenance: Boy, does this bat have provenance! 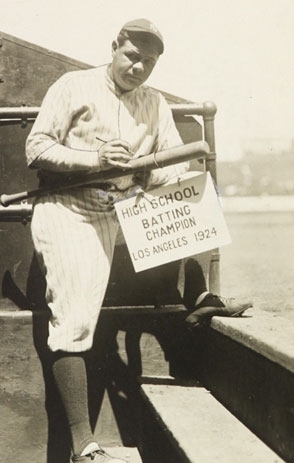 Babe Ruth’s brilliant marketing agent, Christy Walsh, created a three year promotional contest (1923-1925) for which a youth batting champion in the California area would receive an autographed bat which Ruth used to hit first homerun of the season. The hobby’s most valuable bat in private hands is universally recognized as the inaugural contest winner’s bat, “Autographed bat used by Babe Ruth to hit the first homerun in old Yankee Stadium” which remains the corner stone of the hobby’s most prestigious Yankees collection. The bat has been proudly displayed at Yankee Stadium and draws tens of thousands of fans when available for public viewing. When speaking with the owner of the 1923 Babe Ruth First Home Run at Yankee Stadium bat and other advanced collectors, it has been stated that the first contest bat is worth in excess of $10,000,000. Ruth bats of that caliber have surpassed the market forces of sports memorabilia and have elevated into the world of fine arts. Plain and simple, this is the only bat of that caliber available for public sale and the value could be compared to recent contemporary fine art sales. To further compliment this elegant artifact, as part of the contest promotion, Ruth personally signed the top barrel of the bat in steel tip fountain pen using black fountain ink. The autograph and personal inscription read, “To the Champion Batter, Los Angeles High School League, Babe Ruth 1924”. The autograph has been verified by Jimmy Spence of JSA Authentications and his full letter accompanies this lot. Shortly after, the bat would be awarded to the champion batter, Phil Grossman. To document the provenance of this bat, we are publishing experts from Eric Johson of KOMO news who recently interviewed Mike Robinson, the nephew of the contest winner Phil Grossman. He writes, “And it starts in 1923, in Los Angeles, California. There was a newspaper in those days called the Los Angeles Evening Herald. In an effort to drum up interest in the high school baseball season, somebody dreamed up a contest. Whoever won the city league high school batting championship would win a prize. And the prize had to be something so wonderful that people would follow the batting race on a daily basis, and buy more newspapers to follow the chase. Somehow, someone got the great Bambino himself to sign a contract. After he hit his first home run of 1924, he would sign the baseball bat, with an inscription for the high school batting champion. Sports page headlines from the Evening Herald that season give us an indication of just how important this prize was. "Prep Stars in Hot Race for Hitting Honors," said one headline. "Jefferson High Swatters Open Up For Ruth Bat," said another. "Phil Grossman, a lanky junior outfielder for Jefferson High School in Los Angeles, was among the leaders for most of the season." One article in the Herald said in large, capital letters, "Looks like Phil Grossman will sure cop the Babe Ruth bat that is offered by the Evening Herald to the City League's best hitter. The whole school hopes you get it, ole kid." "In the last game of the season, Grossman ripped a single to clinch the highest hitting crown." The bat would be his. On April 20, 1924, at Griffith Stadium in Washington D.C., the greatest pitcher of his time, or maybe ANY time, was on the mound for the Washington Senators: The Big Train, Walter Johnson. He would lead the league that season in wins, strikeouts, shutouts and ERA. But on this day, Ruth got a pitch he liked, loaded up on the back foot, lunged forward, released his hips, which sent his 36-inch Hillerich & Bradsbury bat arcing towards the ball with awe-inspiring force. Ball met bat and an unmistakable sound echoed through the ballpark. If it looked like most of Ruth's blasts, it was a towering moonshot of a fly ball and necks strained to follow it through the air, and when it reached its apex it felt as though it hung there in space for a split second before lazily plummeting back into earth's atmosphere, landing well beyond the right field fence. The Babe had done it again! It was his first home run of the 1924 season. Later, a photo was taken of Ruth signing the bat with a fountain pen. Somebody, perhaps a newspaper employee sent to fetch the bat, had the foresight to hang a sign off the end of it as he signed. The sign said, "High School Batting Champion, Los Angeles, 1924." That sign, printed on a card, hanging from the piece of lumber, would become an all-important factor 100 years later. It placed him with a particular bat at a particular place and time. Ruth, who signed tens of thousands of balls and hats and scraps of paper in his lifetime, probably didn't even notice it. After the World Series that year, Ruth went on a barnstorming tour. He played exhibitions on the West Coast with a group of other Major Leaguers. Walter Johnson was among them. On Oct. 31, they played in the small town of Brea, not far from L.A. It was Walter Johnson's hometown. And at some point around that time, young Grossman was taken to meet The Babe. A picture was taken of the two of them together. It appeared in the Evening Herald, with a Herald headline that said, "Look! Two Champs." Grossman had family in Bellevue, Washington, including a baseball-crazy young nephew named Mike Robinson. Mike's family would visit Los Angeles occasionally to visit Uncle Phil in his stucco home in the Hollywood Hills. Mike was only 8 years old at the time, but he remembers that his uncle was tall and athletic, and that he always drove a nice car. And when he would arrive at the house, his uncle knew exactly what the boy wanted to see. "I'd come in the living room," Mike says now, "and the first thing he would do is go under the stairs and pull out his box of stuff. And all I cared about was looking at his stuff, and the bat, of course, was the cherry on top." It's easy to imagine a child trying to swing the massive, time-darkened Ruth bat, marveling at the inscription, running his fingers over the name and listening to his uncle tell the story of winning the batting title meeting the great Babe Ruth. “He loved telling that story,” says Mike. In 1986, Grossman died. Mike, who was a 32-year-old man by this point, secretly hoped that his uncle's baseball collection would have been willed to him. It was not. Instead, the family held a family-only estate sale. Mike bid more than $3,000 for the bat, the scrapbook, the glove and the autographed ball. It was his. The sports memorabilia craze was just starting to gain traction in the 1980s, and by 1989 Mike wondered what exactly he was sitting on. Was his bat worth a lot of money? Hundreds of dollars? Thousands? A friend put him in touch with a man who was supposed to know about those kinds of things. He told Mike that he would take the bat to Los Angeles, that he knew people who could give him a price. Thinking back to that day, Mike hates to even speak the words. "So I said, 'Go ahead and take it down there and let me know what somebody's willing to offer for it and then I'll decide what I want to do with it.'" The man left with the bat. Mike never saw him again and the Babe Ruth bat and his uncle's scrapbook were gone. Vanished. Stolen. Mike went into business setting up home theater systems. He didn't see the bat again for a long, long time. Somewhere along the way he set up his cellphone with a Google Alert. If anything popped up involving Babe Ruth memorabilia being sold, he would get a notification. Hundreds of them came and went. There was never anything about his bat. It was as though his treasures had slipped away into the tangles of time itself, like the batting race of 1923 and The Babe and his Uncle Phil in Los Angeles. And then, on his birthday in 2017, he got another alert on his phone. Today, as he tells the story, he is filled with wonder, as though he still can't quite believe what happened. "I opened it," he says, "and there was a picture of my bat." There was a link to an article about the bat being put up for auction. The headline of the article said this: "1924 Babe Ruth Autographed First Home Run Bat - Could Become Most Expensive Piece of Memorabilia Ever Sold." Mike says that when it all sunk in, he fell to the ground. And then he went to work. He called the FBI and got some advice. He hired a lawyer. He got the auction stopped. A court date was set. The bat had been purchased by brothers George and Steve Demos. Their father had purchased it in 1989. The Demos brothers had done nothing wrong, neither had their father. Just as Phil Grossman’s bat meant the world to Mike Robinson, the Ruth bat represented something very special to George and Steve Demos. The boy’s parents divorced when the Demos brothers were very young. The elder Demos, Steve Sr. sought a practical means to continue to bond with his boys. Some fathers may have sought fishing or going to playing/attending baseball games as the means to spend time together, but for Steve Sr, he desired something with greater meaning. Steve Sr. was introduced to baseball at a young age where he attended Chicago White Sox games as a guest of family friend Ray Berres. Also of Greek heritage, the Demos family were close friends of Milt Pappas, together spending many nights in Chicago’s Greek town restaurant district sharing stories of baseball and family. For anyone that knew Steve Sr., conventional was not a word associated with the man. He had keen instincts for business, and saw the future value of game used baseball bats, always striving to collect the very best that were available. With a close relationship to early bat pioneer Dave Bushing, Steve Sr. built arguably the finest game used bat collection to have ever been assembled. But, his sons were not spoiled by their father’s business success or world class bat collection. With each bat that was purchased, George and Steve were made to place the bats in tubes, tape the bottoms shut, create identification labels for each bat, and enter the bat, purchase price, and other pertinent information into a hand written spreadsheet. Then, repeatedly they were asked to learn dating era of the bat, manufacture, and use traits. Countless notes were taken and maintained for each bat, and the boy’s treated their collection like a stock portfolio. Value was not the driving force, but the bat collection taught the boys respect for the product and good business principles of how to take care of an asset. Over the next thirty years, the brothers would continue to grow and maintain their collection, internalizing the lessons taught by father in hopes of providing his son’s the tools on how to survive in the world on their own. Sadly, in 2007 Steve passed away and left his life’s teachings and collection to his sons. Steve Sr. succeeded in using the game used bat collection as a tool and symbol on how to run a business. Brothers and partners, George and Steve Jr. own and operate several successful franchises and businesses in northern Illinois and southern Wisconsin. Even with all of the wisdom passed from father to son, inexperience can miss out the detection of the presence of evil. 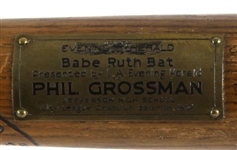 From its use by Babe Ruth in 1924, awarding to Phil Grossman, ownership by Mike Robinson, purchase by Steve Demos Sr., the bat had one more custodian, John Rogers. In an attempt to grow their business empire and sticking to the field they knew best, sports memorabilia, the Demos Brothers entered into an agreement with John Rogers, the man behind the world’s largest original photo empire. John Rogers owned the world’s largest private collection of photographs, using the business model of free digitization of photos for various newspapers. With newspaper shifting from print to online readership, the papers no longer had the need for the original photos and the promise of a digitalized archive made good business sense. But instead of using the money generated from the sale of photos, the Daily news reported, “he used the money for personal and business expenses and to pay off other investors he had defrauded.” In a scheme so elaborate it was featured on the TV Show “American Greed,” the $3,000,000 sell price was never paid by Rogers and brothers had to negotiate to purchase the bat back. Once the bat was back, the Demos brothers decided to sell the bat, creating the google alert pinged by Mike Robinson. After pending litigation, judge decided there was only one fair thing to do: auction off the bat and split the proceeds between Mike Robinson and the Demos Brothers. The legal proceeding have guaranteed the owner a clear title of ownership and adds great financial benefit to this historic bat. MEARS A10: Length 36”: Per a review of Babe Ruth’s personal bat records and documented examples which have entered the hobby, 36” was a length ordered and preferred by Ruth on his top of the line bats. This bat perfectly matches those specifications. Weight 41 ounces: Currently weighing 41 ounces, Ruth’s personal bat records and documented examples which have entered the hobby support bats being shipped weighing 40-46 ounces. At 41 ounces, this bat falls within the optimal, highly desirable 40+ ounce bats desired by advanced collectors. Model R2: Although not stamped on the bat, the shape of the knob, handle, barrel and barrel end is consistent with the R2 model which was the original model designed and used by Babe Ruth. The R2 is referred in H&B factory records as “his #1 model”. Game Use: Bat exhibits heavy, optimal game use with a heavy concentration on the left barrel side. Cleat marks appears on the front and right barrel. After review, MEARS assigned the bat the grade of a MEARS A10. Base grade of 5 points for bat being consistent with model, length, and weight ordered by Ruth during the era. 3 points for optimal game use 2 points for provenance and player traits. PSA/DNA GU 10: Bat expert John Taube reviewed the bat and noted under player characteristics, “Two notable player characteristics are displayed on this Babe Ruth professional model bat. The first being a defined left barrel contact area and the second the appearance of small cleat impressions on the right and front barrel. Period photography has captured Babe Ruth at the plate using a label down grip. The label down grip is depicted by the appearance of the center brand facing the camera as Ruth, a left handed batter, completes his swing. If holding the center brand up the back of the bat would face the camera as Ruth completes his swing. The grip results in a contact area above Ruth’s branded name on the barrel. The label down grip was a constant for Ruth throughout his career. In addition to the left barrel contact area many of Ruth’s documented bats have small cleat impressions on the barrel. Film footage of Ruth during his career shows him clearing the dirt from his cleats between pitches. Both the left barrel contact area and the appearance of cleat marks on the barrel have been recorded on several high graded Babe Ruth bats in our PSA/DNA database”. Taube goes on to state, “Babe Ruth game used memorabilia dominates our industry. His fully documented material occupies an area all by itself. It seems that everyone wants a piece of the Bambino. This larger than life ballplayer has assumed a mythical quality, transcending his sport and finding his place in the cultural heritage and folklore of America. In addition to the bat’s unquestionable history, Ruth’s autograph and dated inscription confirms the events outlined in the many articles that are included with the bat, further elevating its stature in the realm of his finest documented bats. After his review, Taube assigned the bat the highest grade of PSA/DNA GU10. Photo Support of Provenance: To support the authenticity of the bat, an original TYPE 1 photograph accompanies this lot of Babe Ruth holding a bat and autographing it. Hanging from the bat is a sign which reads, “High School Batting Champion, Los Angeles 1924”. It is our belief that this is the very bat used in the contest and offered with this lot. Upon review by John Taube of PSA, he states he does not believe this is the actual bat due to what he claims as a cleat mark on the pictured bat not present on the subject bat. 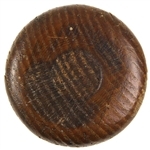 It is our believe what Taube calls a cleat mark is a flaw or cropping enhancement which was added by the newspaper at the time of publishing and is quite common for the era. 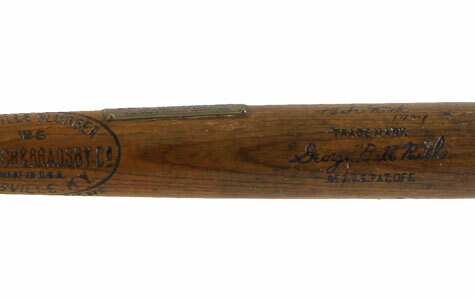 When applying a market evaluation to this offered Ruth bat, one must look at the history of the game used Babe Ruth bat market and place this bat in its proper context. 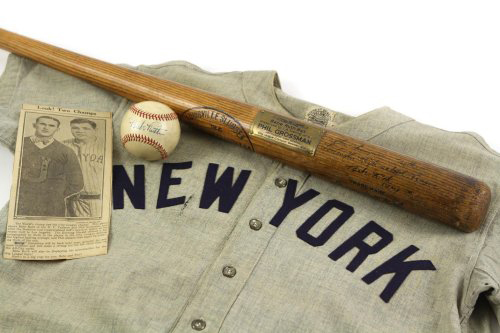 During December of 2004, the 1923 bat used by Ruth to hit the first homerun at old Yankee Stadium became the first Ruth item and first game used bat to surpass the $1,000,000 mark, illustrating the star power of the Bambino. In May of 2012, Ruth's 1920s Yankees road jersey sold for $4,400,000. The jersey has since sold privately for considerably more, again supporting Ruth as the hobby's most iconic brand. Numerous additional Ruth bats have entered the hobby and have sold in the $200,000 - $591,000 price range. Each historic, valuable, and likely to appreciate in value based on their own unique traits, but they do not possess the pedigree of being blessed and promoted by Babe Ruth and Christy Walsh. Having these desirable traits, the value of this bat is predicted by some industry experts to enter the realm of fine art. There are approximately 6 more bats that have sold in the $200,000 - $400,000 during the same relative time span. None of those featured the combined traits and provenance as the offered 1924 Babe Ruth Bat owned by Phil Grossman and necessary to be considered the finest known. With respect to the 1923 Babe Ruth First Home Run at Yankee Stadium bat, it is universally recognized as the hobby’s #1 game used Ruth bat with an estimate value in excess of $10,000,000. 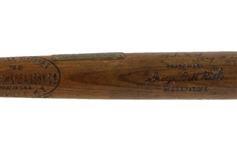 With this offered bat entering the hobby as the 2nd leg of a three year promotional contest (1923-1925) sponsored by Ruth’s manager Christy Walsh, smart money ranks this bat as the 2nd most important Ruth bat in the hobby. The ranking is quite important as that fact coupled with additional historic traits of this Ruth bat allows the next owner membership to a very exclusive club, owner of a bat from the exact same contest which produced the hobby's finest known bat. As published by The Sportster in 2016, of the top 15 highest priced sales of sports memorabilia of all-time, 7 of those were owned by Babe Ruth. The rank and sales prices of the Babe Ruth owned items are shown below. NOTE: For this lot, there is a ZERO Buyers Premium.